Apple planning to launch iPad 2 in India, anytime soon? It seems that Apple is planning to launch iPad 2 in India and this time there will not be such a long gap in launch times between USA and India as it was in case of iPad launch. Today while surfing the Internet I visited Apple India’s website and was surprised to see iPad 2 on Apple India’s website. The other reason which make me think that iPad 2 will be entering India soon, is the recent price reduction of iPad which came after just over a month after its launch in India. Moreover, if Apple is not planning to launch iPad 2 in India any time soon, why on the earth will they promote iPad 2 now. 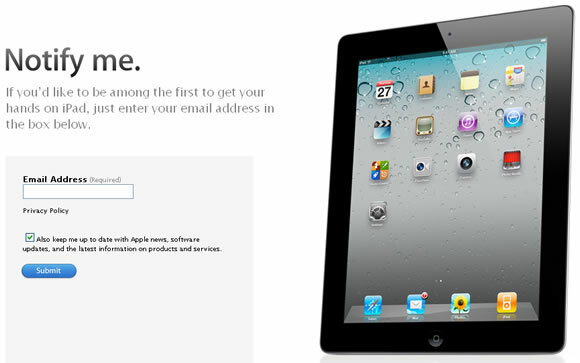 There is also a ‘Notify Me’ Page for iPad 2 which says “If you’d like to be among the first to get your hands on iPad, just enter your email address in the box below.” Why will Apple India enable this option if they are planning to launch iPad 2 in India, let’s say, after 10 months. I don’t see a reason in doing that so I feel iPad 2 is coming to India soon. If you are planning to buy an iPad anytime soon then my suggestion is to wait for a month or two, if you are not in a hurry to get an iPad. Update : iPad 2 coming to India Soon?